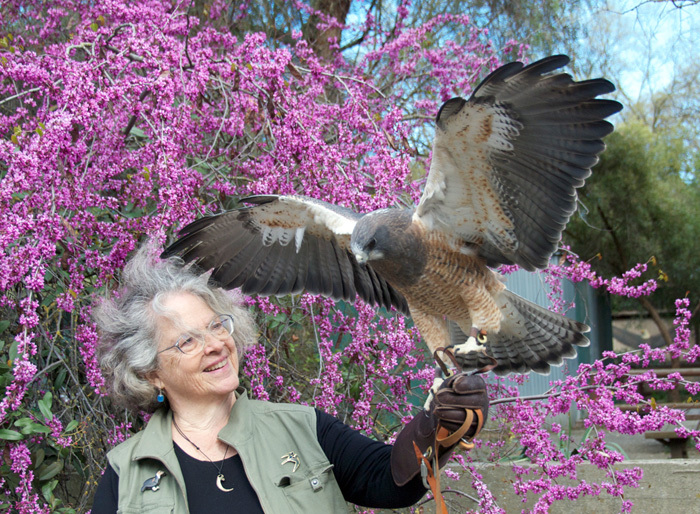 Once upon a time, two California wildlife rehabilitators began to dream a dream. Kelli and Sallie come from very different backgrounds and wear very different hats at different times – author and carpenter; teacher and safety manager; editor and park ranger. But they share a love of wildlife, especially birds, a great appreciation for the outdoors, and the desire to educate. Kelli and Sallie met while volunteering for Sierra Wildlife Rescue, a rehabilitation organization in El Dorado County that also has an education department. Their paths crossed on many occasions and we began talking about common desires: We wanted to expand our participation in education, especially in schools, to include the ecology of the Central Valley and its inhabitants. So the dream began to build – slowly, a little bit with every conversation. In 2011, “Git 'er done Kelli” decided it was time to see if we could bring the dream to reality, and start a new education group to explore our specific interests, with our own permit. Sallie agreed it would be great. But, she said (knowing a little something about dealing with government departments): “If we get this permit, I will eat my hat.” Still it was a dream worth pursuing. So we worked hard to put a package together that would give us our best shot. Then we waited. And waited. Would we ever get an answer? The permit application says to expect a 60–120 day turnaround, but we went way longer than that. Fourteen months went by. Then, just as Kelli decided that our application had been lost and was preparing to resubmit, she got the good news. Hawks, Honkers & Hoots was real and official! Sallie got a phone call: “Hey! Ready to eat your hat?” The great news took us by surprise, and we celebrated wildly. Then reality sank in. We have a lot – indeed, years – of work ahead of us. Work that won’t end. Because if you stop learning, you stop being able to grow. And if you stop growing, you can’t really teach anything. At the beginning of 2013, we made great progress toward our dream. We trained some wonderful non-releasable birds to share with you: a Red-tailed Hawk named Murphy; a Peregrine Falcon named Bolt; a young Canada Goose (so far unnamed); a Western Screech Owl named Clicky, and a Burrowing Owl named Digger. We have chosen an area to explore and share: The Central Valley Watershed, with its multiple habitats and millions of life forms. There’s even more: We are currently in the process of obtaining our 501(c) (3) status, developing teaching materials for audiences of all ages, expanding our website and Facebook, identifying Board Members, and raising funds. All at once! 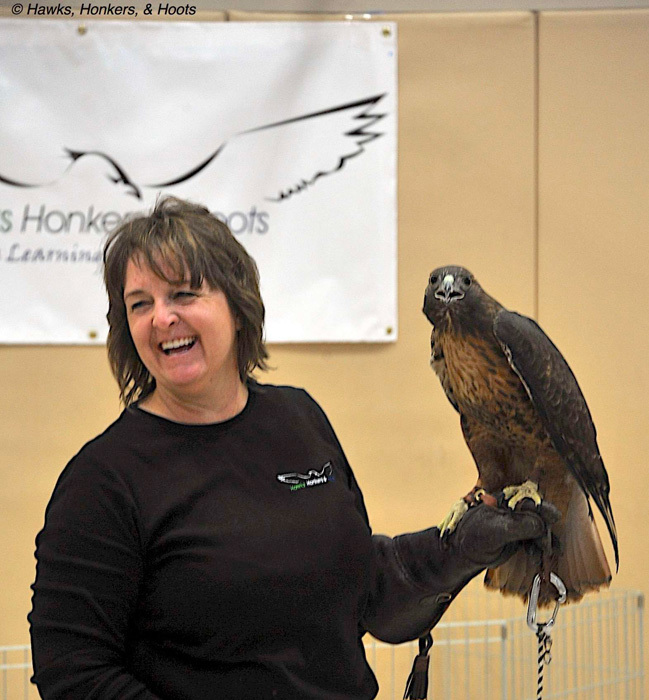 Hawks, Honkers & Hoots has big things planned for 2014 and beyond, and we invite you to join us in realizing our dreams. Our greatest hope is that we can help you learn to love the Watershed and its marvelous birds, and that you, in turn, will help us build appreciation for all this fascinating life throughout the community. We look forward to meeting you!